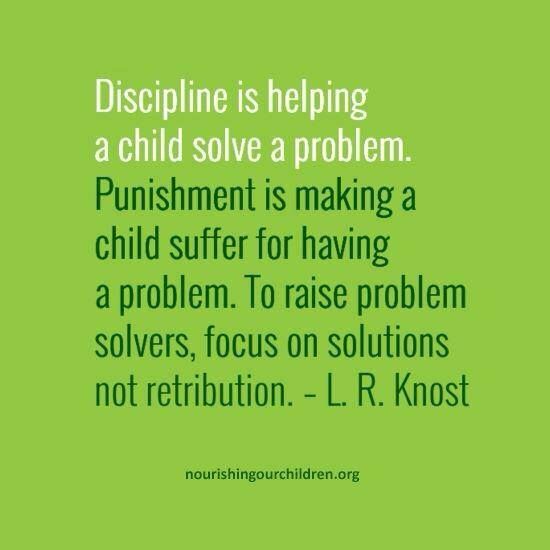 This quote is saying that rather than getting “payback,” you should be using discipline to help solve a problem. A lot of times, we get offended or our pride hurt by our child’s actions. We react to their actions with anger rather than what is best for the moment. It is important to think before you act. Give yourself a time out if needed to cool off and get your head where it needs to be. Always remember, your child isn’t out to get you. Your child is a little more selfish than that, frankly. When your child disobeys, it is to satisfy your child’s own wants, not to say, “Ha! I am going to get mom good on this one!” Some actions are done to get your attention, but again, it isn’t to get to you, it is to get your attention. Get you to pay attention. Your job is to help your child learn what was wrong and have a proper consequence to help your child remember to not do it again in the future. Remember, solutions, not retribution. Hi! My 29 mo has been very upset after every nap and night sleep for about 2 weeks. He has woken up crying from those his whole life but now he's inconsolable. I've tried offering food right when he wakes (low blood sugar? ), offering to hug/read books (he loves them), turning on music and immediately leaving the room so he can get up on his own, etc. It normally lasts 45 mins and I can't let him scream the whole time because my husband is trying to sleep (works nights). The best way to snap him out of it is to come up with something super cool to distract him but sometimes he goes right back into it. Any ideas/suggestions? Have you tried turning on a show?I think a trick here will be figuring out the reason for the crying. Is he not going down at the right time? Is he crying in order to be offers cool things? It sounds extreme to be simply a grumpy waker. He is also old enough to tell him it isn't okay to go on and on. This could be a good topic to see if other readers have experience to draw from. I am happy to post this question to readers and see if anyone has insight if you like. Oh yeah–he isn't teething, has gotten over the cold he had, and isn't learning new skills. Thanks for the response! He's gotten much better in the past few days so maybe it was an older Wonder Weeks type of thing? He's still a grumpy waker but not as bad. When it does happen I don't think it's because he wants to be offered cool things (because it doesn't really work well anyway). Also he's napping and night sleeping great so I don't think it's that (goes to sleep quickly, sleeps all night or 2.5 hrs for nap). We don't do screen time but I think a show would work great while it was on. After that he would cry for more show and ask me a million times over the next 4 weeks. Could I get my reader question on another pressing issue? Since he kind of came out of the funk I decided to potty train. I think he's really ready (holds it, feels it coming, knows the vocabulary for it, etc). He pooed and peed during roomtime BY HIMSELF the first day but since then hasn't gone on the potty and now says he doesn't want to go on the potty. He still wants to wear underwear but I think if I put him back in diapers (you can't wear underwear if you don't pee in the potty) he would be happy with that because then he definitely wouldn't have to go in the potty. How do I get him to want to go in the potty? I'm not sure why he doesn't want to go–I don't think he's able to tell me why yet. PS-He held it for 9 hours that first day so I can't just give him treats for being dry every 30 mins like it says in Pottywise. Today is day 2-he wet his pants once and probably went while napping (still asleep) but was in underwear for naps and nights. My point is he doesn't mind being wet. I showed him some car underwear and said he could have them went he peed or pooed on the potty but it hasn't worked yet (although he seems excited about it).